Schaffer articulated loaders have impressive flows to the auxiliary outlets. All controls are built into the joystick so operating a 4-in-1 bucket or an auger is a joy. All Schaffer loaders come with hydraulic quick attach tool frames as standard, to gain the maximum versatility from your front end loader. The range of attachments available for Schaffer loaders includes Schaffer genuine tooling and the complete Digga range. Below is just a sample of the options on offer. If you can't find the attachment you require please contact us as we have created many customised solutions for our customers. Schaffer, Kerfab, Himac Industries or locally manufactured GP buckets available for all Schaffer loaders. 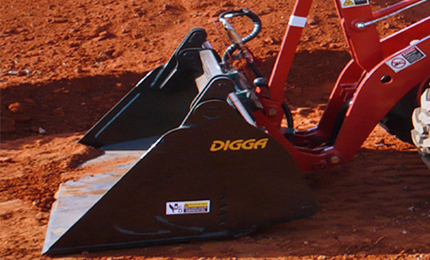 Digga 4-in-1 buckets for all Schaffer articulated loaders front end loaders. Schaffer Loaders original heavy duty reinforced heel forklift style pallet forks 1.5 tonne to 3.5 tonne, with optional high load guard. Schaffer original pallet forks are recommended from articulated loaders model 3450 up and for all front end loaders and telescopic loaders. 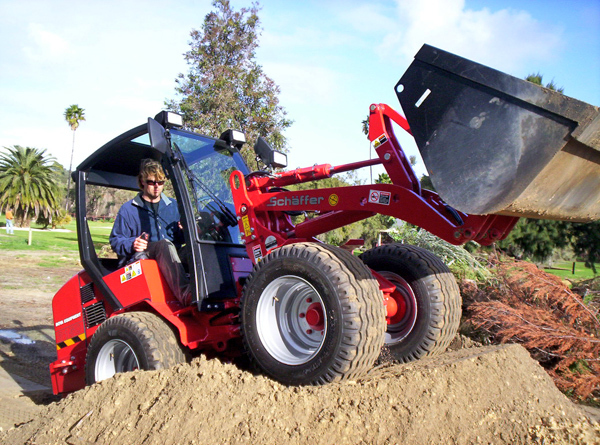 The small series of articulated loaders use Digga 900kg rated pallet forks. Digga augers PDX2-2 to PD8 for all Schaffer articulated loaders, front end loaders. Digga Bigfoot trenchers for the complete range of Schaffer articulated loaders, front end loaders. Digga lightweight aluminum ramps available for all Schaffer articulated loaders, front end loaders. Your choice of side, mini, angle or bucket broom for all Schaffer articulated loaders, front end loaders. 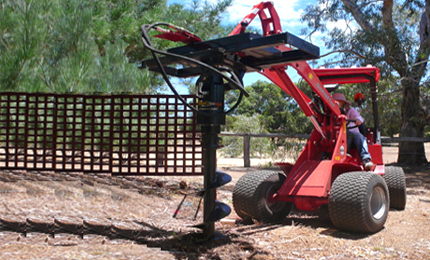 Australian-made heavy duty rake buckets with optional of hydraulic grapple. Schaffer Loaders genuine light materials buckets have a much greater volume for all light goods such as grain, woodchips and mulch. Up to 2cu m struck capacity buckets can be supplied for your Schaffer mini loader, mini digger, wheel loader or front end loader. Australian-made heavy duty grab buckets available for all Schaffer articulated loaders, front end loaders. 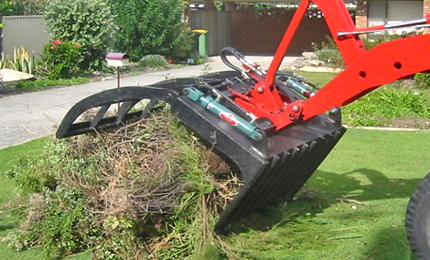 Heavy duty green waste or manure grab with two hydraulic cylinders and extra strong tines, widths from 1.60 m to 2.40 m.
Schaffer Loaders genuine green waste grab is one of the most popular tools on the front of a Schaffer articulated loader. Available in width from 0.78 m to 2.4 m. Pictured is a 1 m model with a single ram. Digga front end loader excavator hoes available for all Schaffer articulated loaders, front end loaders. Earth dozer blade or wheeled snow blade (pictured) with a mechanical or hydraulic lateral adjustment are available from 1.5 m wide for all Schaffer articulated loaders, front end loaders and telescopic loaders. 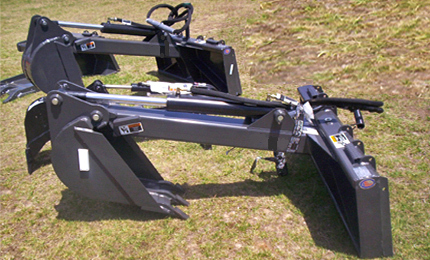 Digga and other manufacturers front mounted slasher mowers available in widths between 1.20 m and 1.80 m. The Digga 1.5m Slasha must have a minimum of 50 hp and 60 litres per minute at 180 bar to run. The optional pressure-free return line is required. European slasher pictured.